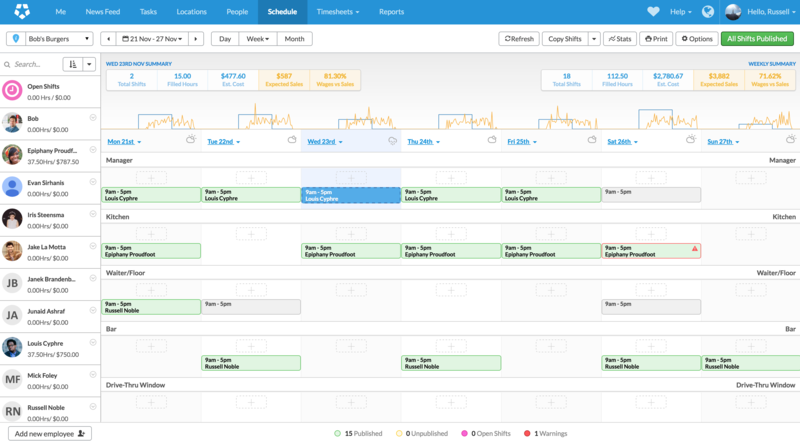 This allows you to schedule faster and more efficiently. 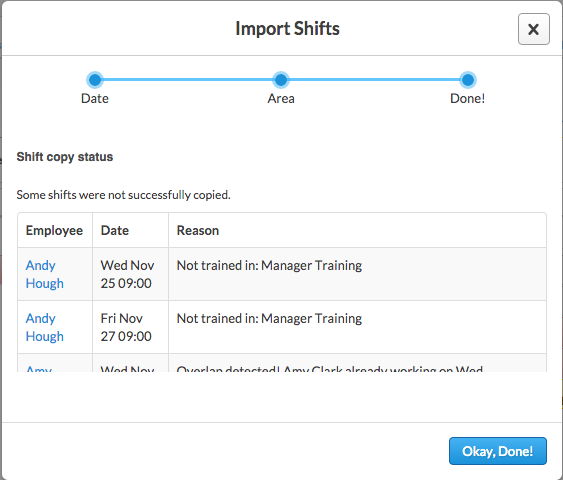 Copying and importing shifts on the Schedule will allow you to rapidly fill your schedule based on past data or weeks. 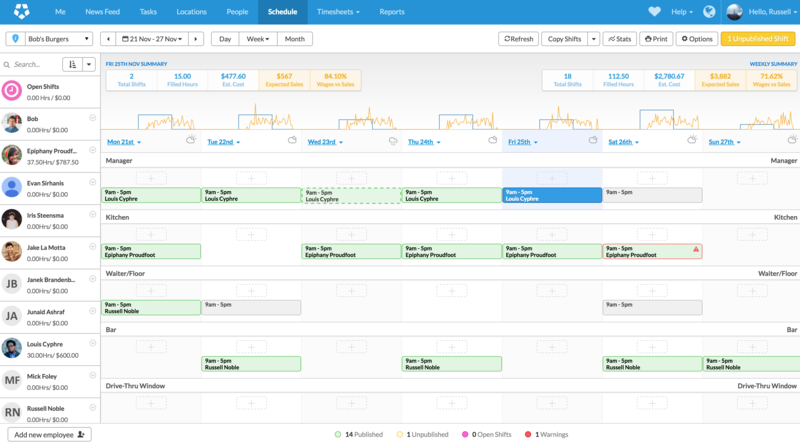 You can copy single shifts, a day's worth, or an entire week. While doing so, you will also be able to select which areas you're copying or ignoring. 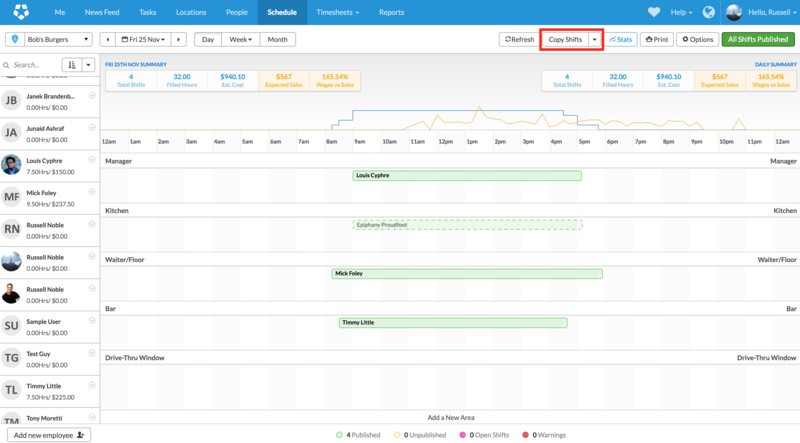 Importing works differently, in that rather than using your current week as a template for future weeks, you are pulling the schedule from a previous week. Please note that importing shifts works on a weekly basis. To copy or import shifts, you will need to have Supervisor, Location Manager, or System Administrator access. If you are a Supervisor, you will not be able to see the costings as displayed below. Please note, when copying or importing shifts the system will run checks to determine that the employee is still available. 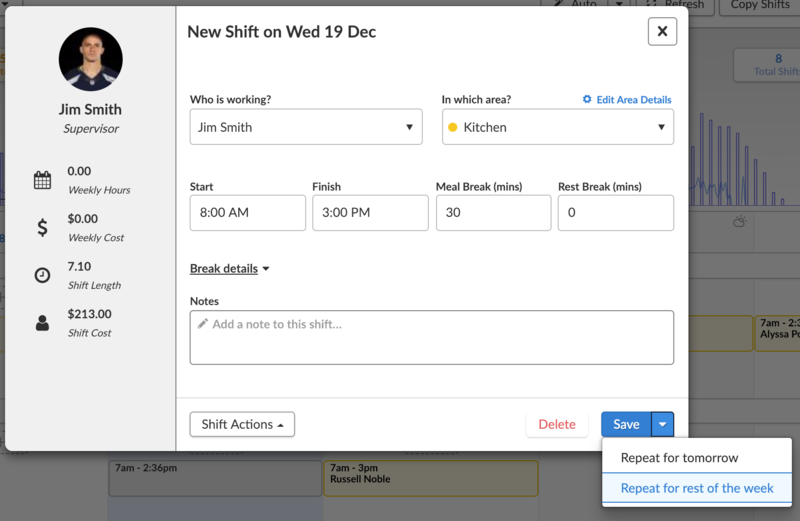 If the employee is not available (working elsewhere, on leave, unavailable, stressed, or not added to the location) the shift will not be copied for you and it will be highlight in red for you. This will also be displayed in the shift copy dialog. To begin, go to the Schedule. 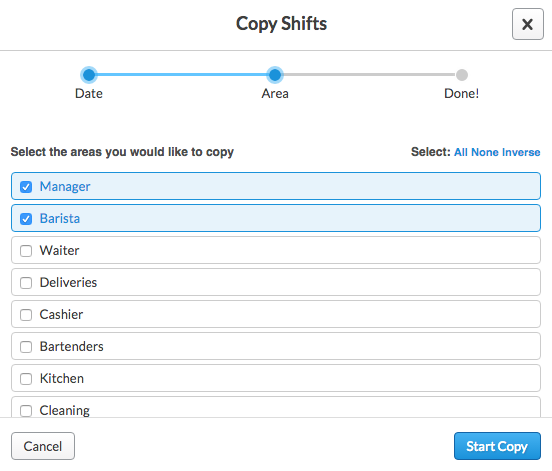 Copying a single shift is quick and easy. First, click the desired shift. You'll see it turn blue as shown below. You will also notice the colour pulsating, which helps identify the selected shift. Next, tap C on your keyboard to copy the shift. You don't need to use Control (Windows) or Command (Mac) to copy the shift. To paste the shift, select the desired day and area by clicking within the area. You'll see it turn light blue. Next, tap V on your keyboard to paste the shift. In the example below, you'll see the shift was copied to the following day. 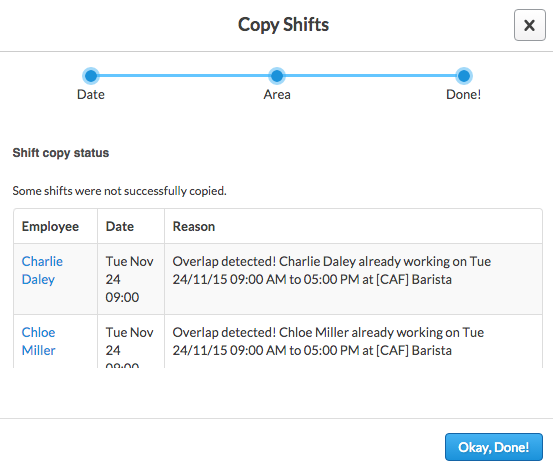 Alternatively, in the Employee Weekly view, simply hover over a shift and click 'Copy (C)'. Then click another day and click 'Paste (V)'. In the Area Weekly view, simply hover over the shift and click 'Copy (C)'. Now when you click another box (another day or area), the Paste option appears. 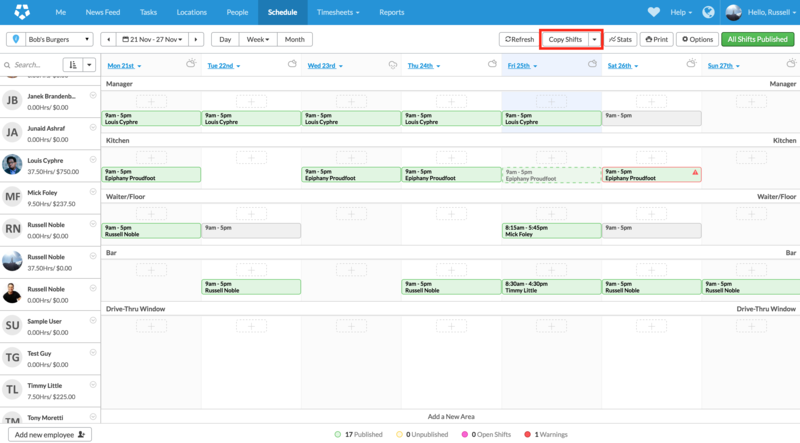 To copy the shifts for an entire day, first open the Day View on the Schedule by selecting the desired day (it will turn light blue), then click Day at the top of the Schedule. Once the Day view is open, click "Copy Shifts" at the top of the screen. This will open the shift copy dialog for you. 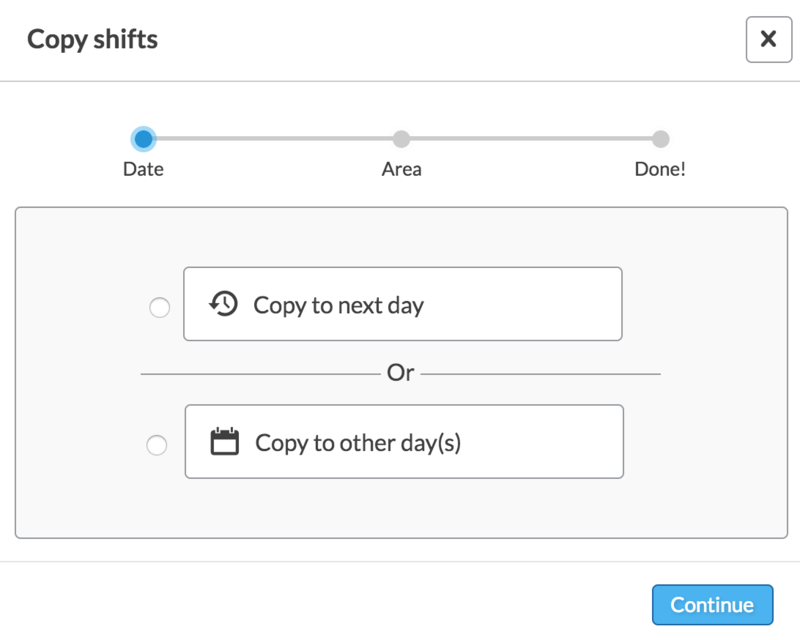 In the first step of the shift copy dialog you will have the option to select whether to copy the shifts to the next day, or to other days. Please click the option you'd like to use. In the below example we will select multiple days. If copying to the next day, click Continue to go to the next step. 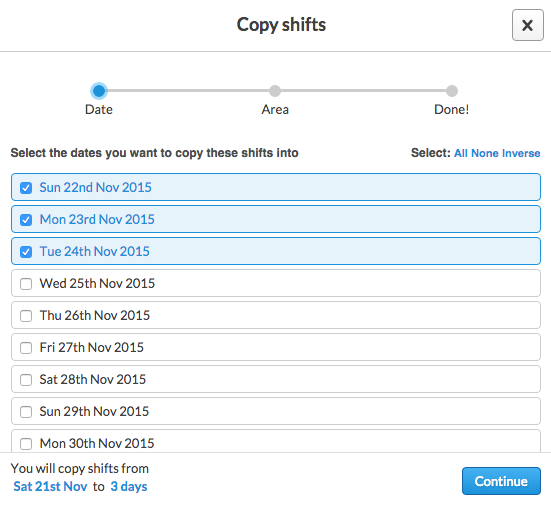 If copying to other days, you will be asked to select the days to copy to. Please click them to select them, then click "Continue" at the bottom. After clicking "Continue", you will be asked which areas you would like to copy. By default you will see all selected. If you'd like to deselect an area (or select one) please click it. You will also see options at the top to select All, None, or Inverse for the areas. Inverse will deselect those you have selected and select those that were deselected. After selecting the areas you'd like to copy to, click "Start Copy" in the lower right corner. After clicking "Start Copy" the process will begin. It can take a short while if you have selected multiple days. Please wait for the process to finish and you'll see confirmation displayed and any errors displayed. Shifts with errors will be displayed in red. Once you're finished, click "Okay, Done!". 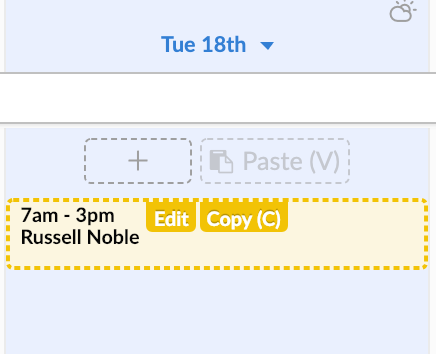 On the Schedule, ensure you're on the weekly view by clicking "Week" at the top of the screen as shown below. 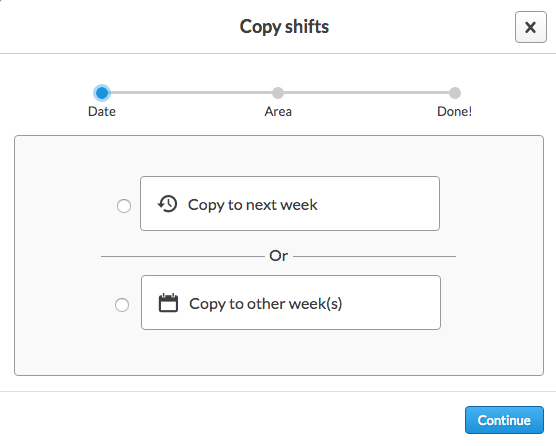 To copy the shifts from the selected week, click "Copy Shifts" as shown. This will bring up the shift copy dialog. 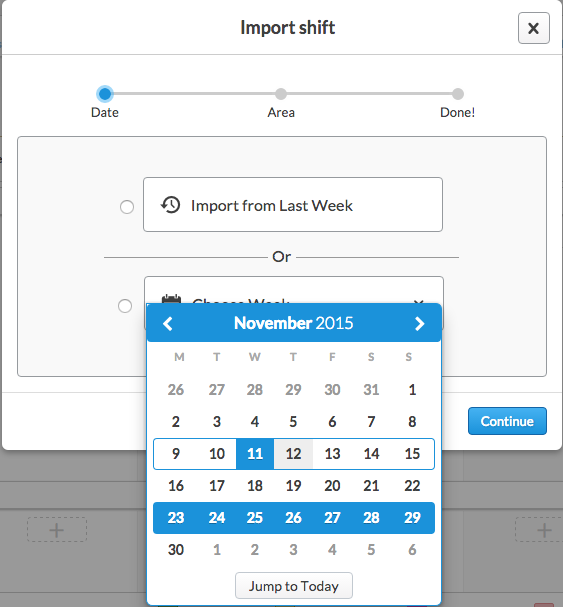 In the dialog you'll have the option to copy to next week or other weeks. Please click your desired option. 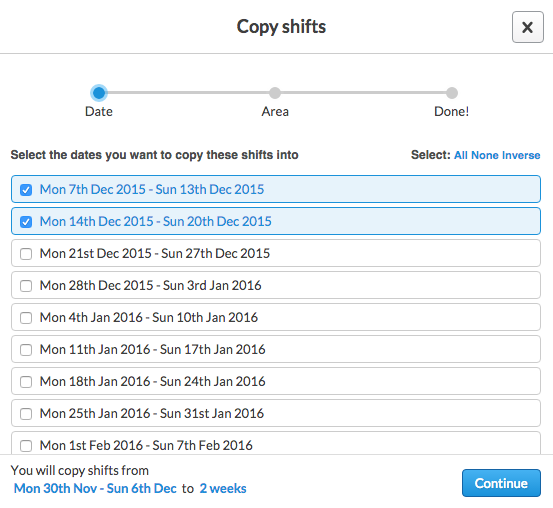 If you click "Copy to Other Week(s)" you'll then need to select which weeks you'd like to copy to. Please do so by clicking them as shown. After selecting your chosen weeks (or if you selected "Copy to Next Week"), click "Continue". After copying you will see a confirmation message to let you know it was successful, as well as any errors that may have occurred. 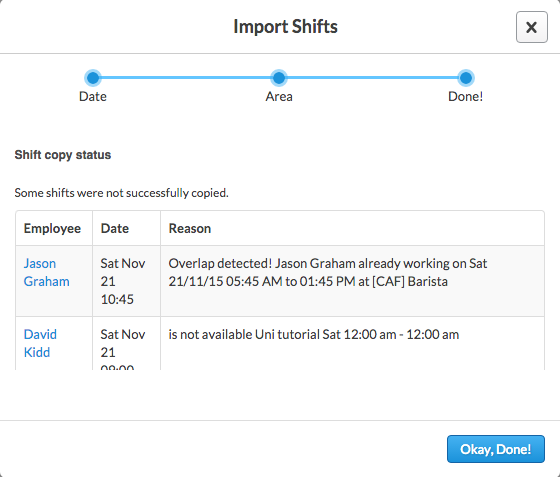 When scheduling, you'll have the option to import shifts to your currently selected week. 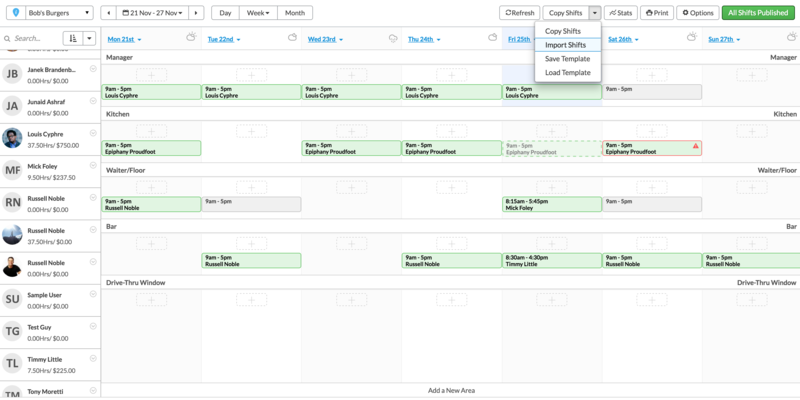 This allows you to quickly pull shifts from a past day or week rather than jumping back to then copy forwards. Please follow the instructions below. 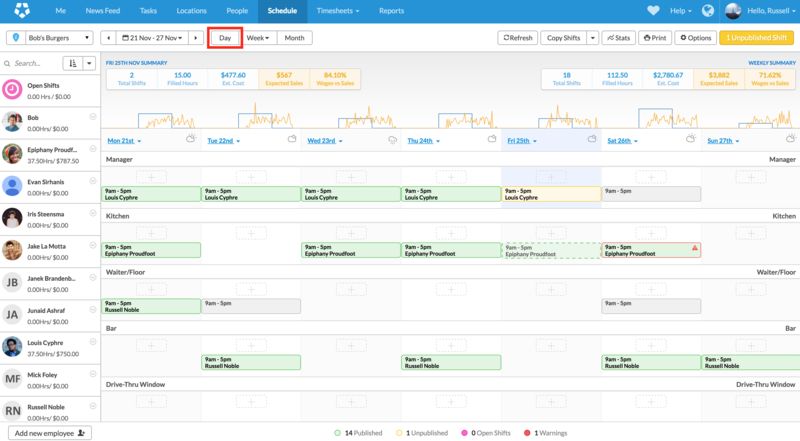 To import past shifts for an entire day, first open the Daily View on the Schedule by selecting the desired day (it will turn light blue), then click Day at the top of the Schedule. Once the Day view is open, click the down arrow next to "Copy Shifts" at the top of the page. Next, click "Import Shifts". This will open up the import dialog for you. 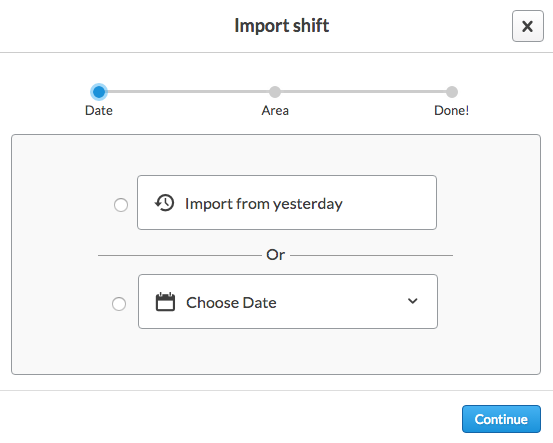 First, select whether to import the shifts from the previous day, or use "Choose Date" to pick any day. 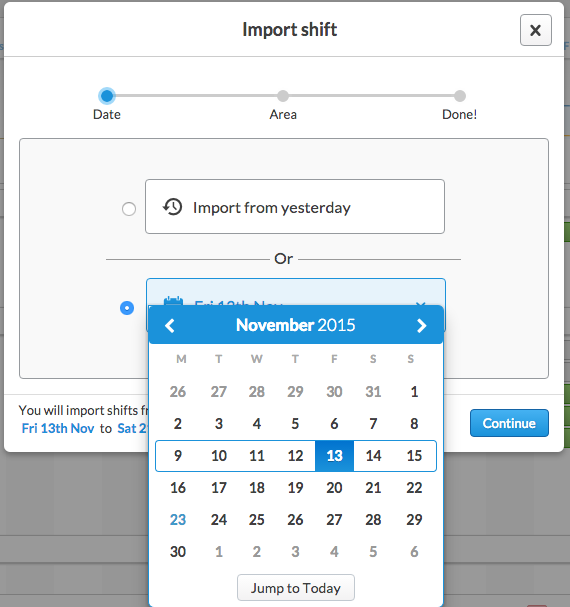 If you select "Choose Date", you'll need to select the day to import from. Please click it on the calendar. Afterwards (or if clicking "Import from yesterday") click "Continue". After clicking "Continue", you will be asked which areas you would like to import. By default you will see all selected. If you'd like to deselect an area (or select one) please click it. You will also see options at the top to select All, None, or Inverse for the areas. Inverse will deselect those you have selected and select those that were deselected. After selecting the areas you'd like to import from, click "Start Copy" in the lower right corner. You will then see a confirmation message to show the import was successful. If there were any errors, they'll be displayed below as shown. After you're finished, click "Okay, Done!". 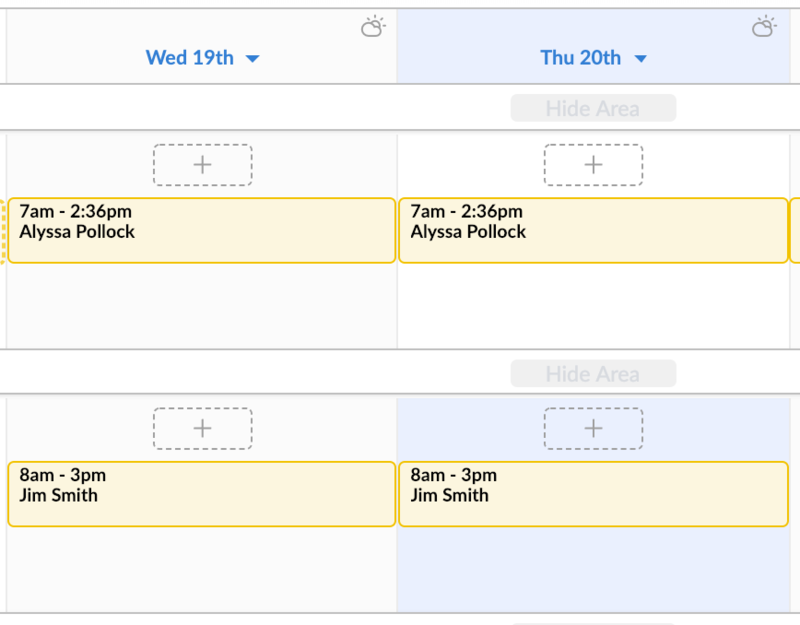 To import past shifts for your currently selected week, first open the Week view on the Schedule by clicking "Week" at the top of the screen. 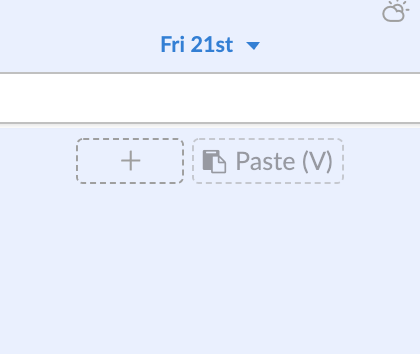 Once the Week view is open, click the down arrow next to "Copy Shifts" at the top of the page. Next, click "Import Shifts". This will open up the import dialog for you. 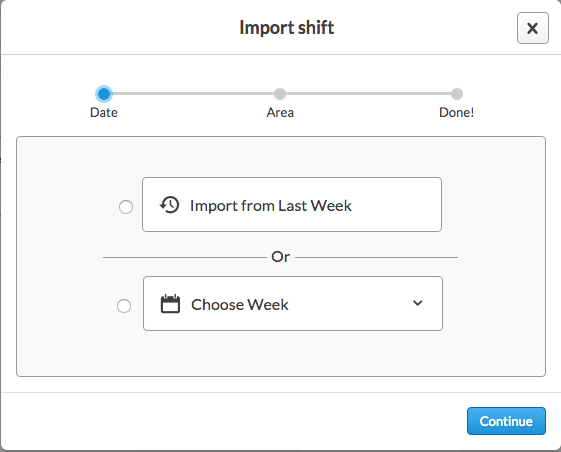 First, select whether to import the shifts from the previous week, or use "Choose Week" to pick any week. If you select "Choose Week", you'll need to select the day to import from. Please click it on the calendar. Afterwards (or if clicking "Import from Last Week") click "Continue". If your roster remains largely the same, you can create a shift that continues on for the rest of the week, or for the next day. 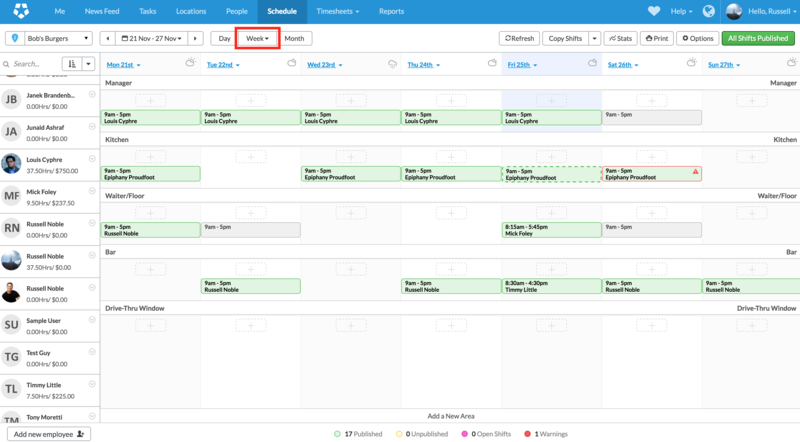 First, open up the 'Add Shift' modal by clicking the + icon on the Schedule page. After you have filled in the shift details, click the drop-down box next to the 'Save' button and you'll be presented with two options.